Sorry for the lack of posts - but just wanted to update you! 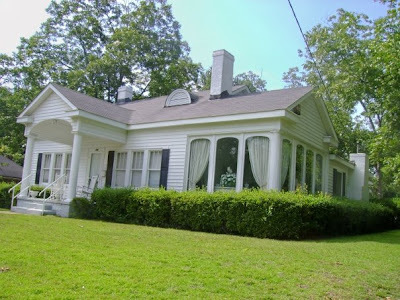 Four (almost five) years after her passing, we have sold my Grandmother's house in Swainsboro, Georgia. Martha Nell -I am her namesake - was a beautiful woman who surrounded herself with beautiful things (she had a flair for fashion and design). With a heart of gold and caring disposition - she was loved by many. It has been hard for my family to even begin to think about going through all of her belongings. Now, four and a half years later, we are forcing ourselves to. While I am looking forward to bringing home some of my grandmother's treasured items - its bittersweet. That home built many memories for our family. This will be the closing of a chapter. Martha Nell was the epitome of a Southern Belle - I only hope that I can live up to her name. I will post more pics of the house and of her pretty treasures... some of which will become my most treasured possessions.